Reference number for this case: 2-Oct-54-Uzerche. Thank you for including this reference number in any correspondence with me regarding this case. The newspaper La Montagne, of Clermont-Ferrand, reported on October 6, 1954, an observation in Uzerche on October 2, 1954. Several people "worthy of trust" living on the Faubourg Sainte-Eulalie reportedly observed a "peculiar phenomenon" in the sky in the direction of Pleux, consisting of a shining dot that apparently moved not like a shooting star but "in the manner Of a craft ", in the south-north direction. There were reportedly several concordant testimonies. These apparitions are more and more numerous. The testimonies of sincere people are becoming more and more important. To bring precision to the whole world, it is absolutely necessary for each of us to be equipped with a camera or a cinematographic camera to fix the appearance of a flying saucer if necessary. Several credible people living in the Faubourg Sainte-Eulalie in Uzerche reportdely saw in the sky. Saturday evening, October 2, in the direction of Pleux (West), a quite peculiar phenomenon. A shiny dot reportdely moved, not like a shooting star but in the manner of a craft, in a south-north direction. Several testimonies are in agreement. Despite of my search, I found no mention of this observation in the ufological literature. Above: because of the length of faubourg Sainte Eulalie (red line) and the proximity of the Pleux Hallet (~500 meters), and as we are not told where the witnesses were exactly, the information on the sighting direction leaves a large approximation, between 230° and 260° approximately. Venus was setting down, going towards the right and down as seen by the witnesses. Ir was below the horizon at 07:43 p.m. It seems difficult to say that the witnesses saw anything but Venus; and also difficult to say it is a "proven" explanation. Venus seems to be the probable explanation to me. 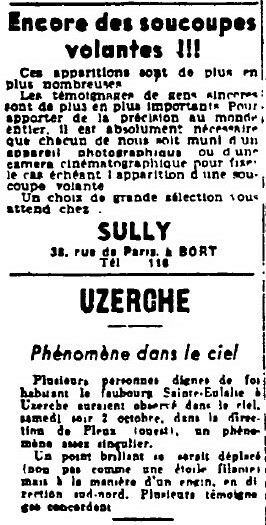 [lm1] Article in the newspaper La Montagne, Clermont-Ferrand, France, page 2, October 6, 1954.